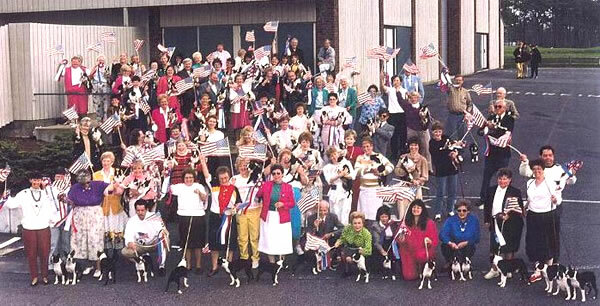 Being one of the first dog breed clubs, created in 1891, the Boston Terrier Club of American boasts over 500 members from all over the United States and around the world. We encourage and promote quality in the breeding of pure-bred Boston Terriers, and to do everything possible to bring their natural qualities to perfection, by urging members and breeders to accept the Breed Standard as the measure of excellence. Our members actively participate with these lively and highly intelligent dogs in many events such as conformation, obedience, agility, and rally. Dedicated to responsible ownership, club participants support areas such as Breeder Referral, Breed Rescue, and a Health Committee whose paramount interest is to inform and educate the public and membership on important key issues facing the breed today. The BTCA is a member of the American Kennel Club, and is parent club to approximately 25 affiliate clubs around the country. Our quarterly newsletter the “Coast to Coast, is a wonderful publication filled with articles, photos, and useful information. Our club holds the National Specialty dog show in either April or May each year, holding this event in rotating regions across the US. We admire and protect our true "All-American" dog, as the Boston Terrier has an excellent disposition making him an incomparable companion. To encourage and promote quality in the breeding of pure-bred Boston Terriers, and to do all possible to bring their natural qualities to perfection. To encourage the organization and development of affiliated Boston Terrier Clubs in those location where there are sufficient fanciers of the breed to meet the requirements of the American Kennel Club. To urge members and breeders to accept the Standard of the Breed as approved by the American Kennel Club as the only Standard of excellence by which Boston Terriers shall be judged. To conduct sanctioned matches, specialty shows and obedience trials under the the rules of the American Kennel Club.